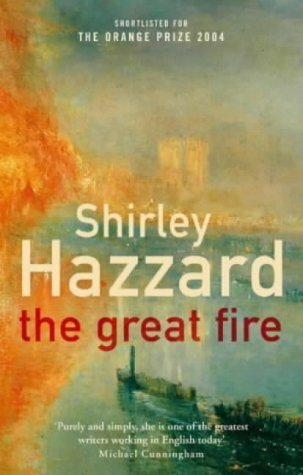 I don't know if it's because I just finished the Mary Renault, with her straight ahead, no messing around, let's get the story told, Billy Wilder-style prose, or if this book is actually a colossal load of crap, but The Great Fire and I did not get off to a great start. As Keith says, just as punk was supposed to have killed off prog rock, so Hemingway was supposed to have nailed (ha ha) this kind of Virginia Woolf flowery crap. So, unless someone can tell me that it all gets better and I really was just suffering some brief psychosis, I don't think I'll be finding out just what's so great about this fire. Thanks all the same. Everyone who's finished it loved it, apparently. I read the first page and then left it by the window and it got rained on and now the pages are crinkly and unpleasant to turn. 'Virginia Wolf flowery crap'?! Patricia, I'm very disappointed in you. The Great One would never have let such sloppy language linger on the page. you are not fit to lick her patent leather button boots. Which are probably cracked and peeling now after that little soaking. Maybe I was just tired. But until someone can come up with a compelling reason to read this book, I ain't bothering.